Ethiopia: Twelve-year-old Tizalem outside her parents house, the day before her wedding to 24-year-old man. Twelve-year old Tizalem stands against the outer wall of her parents’ hut in her village in the Amhara region of Ethiopia. She is getting ready for the neighbourhood hairdresser who will be arriving shortly to braid her hair. It is the day before Tizalem’s wedding to 24-year-old Gegahun. 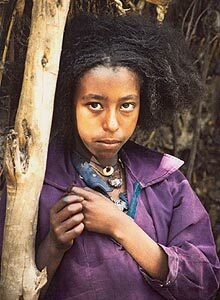 In Ethiopia, and in parts of East Africa, West Africa and South Asia, marriage at the age of seven or eight is not uncommon, making Tizalem older than many brides. Exact figures of the number of early marriages are difficult to obtain, as so many are unregistered and unofficial. 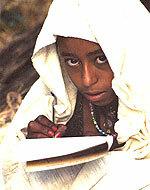 However, Tizalem is one of the girls whose marriage was documented by UNICEF Ethiopia. UNICEF addresses early marriage as part of a broader approach of building a "protective environment" for children which shelters them from this type of exploitation. Early marriage can have harmful consequences to children -- including health problems, spousal abuse and the denial of education. Once married, girls often do not go back to school. UNICEF works in over 70 countries to ensure that girls have an equal opportunity in education, that families and communities are aware of the serious risks of early marriage for young girls, that legislators are committed to prohibiting early marriage and that services are available to counsel young girls who have been abused. After her hair is braided, Tizalem soaks her hands in a root bulb with henna-like qualities that is used for dying the hands and feet of girls and women in her region for special occasions. Tizalem uncovers her face, which is covered by her traditional wedding outfit, only long enough to sign the marriage contract. In keeping with tradition, Tizalem is wrapped in traditional white clothing that hides her face. She is carried from her parents’ hut on the day of her wedding, while the village elders prepare the marriage contract that will bind her to her husband. The contract lists the number of cattle provided by each family for the new couple, and other exchanges of gifts, both cash and in-kind. The contract also stipulates that Tizalem, who is presently in the fourth grade, will be allowed by her husband to continue her studies. Her husband will have to pay a cash fine to Tizalem’s family if he breaks his word. Tizalem uncovers her face only long enough to sign the contract. Her mother leaves her guests and goes into her hut to cry. She agreed to the local tradition of child marriage for her only daughter on condition that a clause was written into the marriage contract forbidding sexual relations between the couple until Tizalem reached fifteen years of age. The elders neglected to put in the clause, and Tizalem’s mother only realized this after her daughter had signed the document. Meanwhile, family and friends have gathered in the village of Tizalem’s parents for an afternoon feast and celebration. During the feast, Tizalem remains completely wrapped in the woven, white cotton wedding fabric and head covering and sits silently next to her new husband. After the celebration, Gegahun will take his young bride home where only he and his family will get to see her uncovered. As neighbours and family members dance in celebration of the couple, the pair departs for Tizalem’s new home.